NOI4 (noy-kwah-tro) translates to “the four of us.” It represents the four members of the Ratti family, and is used at the entrance of their property. NOI4 was also the fourth wine added to Tenuta Sette Cieli’s portfolio and there was a team of four people that chose to make this wine. 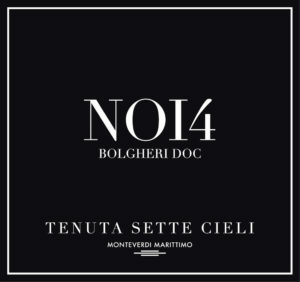 Grape Source: Estate managed vineyard located in the heart of the Bolgheri DOC. The 2015 growing season was a warm vintage, with good polyphenolic ripening, producing full body wines with lot of extraction and ripe aromas. Fermentation: In stainless-steel tanks at controlled temperatures; with indigenous yeast; before the fermentation starts, we do a cold maceration for 3-4 days; 100% malolactic.